Did I find the golden ticket? Hehe. I couldn't resist. 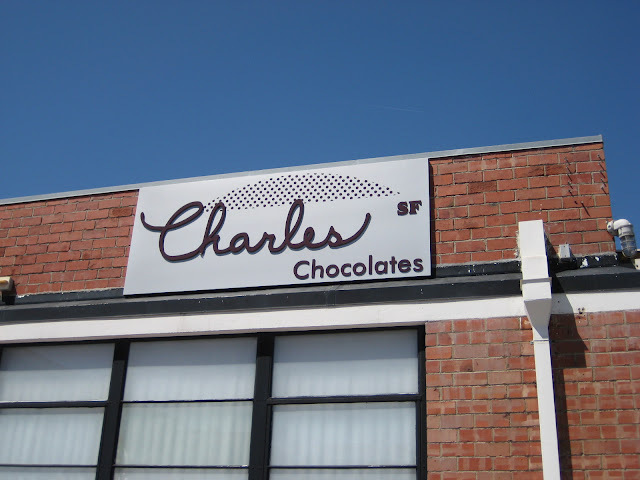 Kicking off a weekend in the Bay Area, we took a tour of Charles Chocolates in Emeryville. It's a brick-lined warehouse with modern accents. Large windows and skylights had natural light pouring in from all angles. There's the storefront, which was originally called the "Chocolate Cafe" (there's still a sign that says "cafe") in front, but customers started expecting sandwiches on the menu, so they changed the name to "Chocolate Bar". One of my favorite items is the edible chocolate box. Talk about environmentally-friendly packaging. This particular box featured tea-infused chocolates. "Tour" might not be the most applicable word, as it implies movement. It's more like a show-and-tell. Chuck Siegel (the "Charles" of the company) gave a talk about the company, then went into the kitchen to show us various parts of their operation. 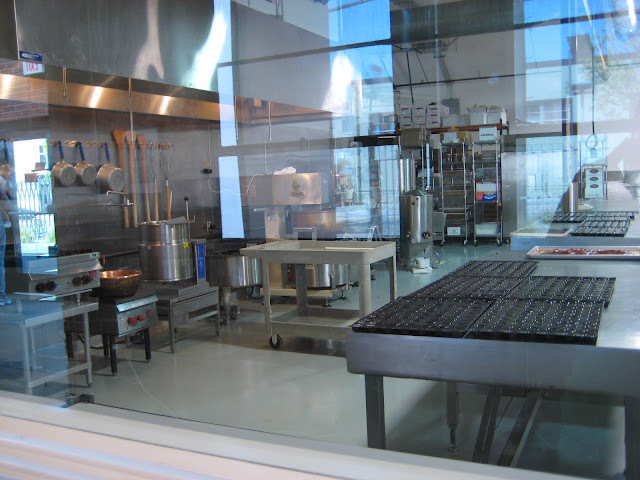 Instead of the group following him, the kitchen is walled with windows on one side and the tour group sits at a bar along the windows. It's a little hard to see with the glare from the windows, but the kettles and pots represent their batch sizes. They don't have large vats and keep things small enough to be mixed (although they have industrial stand mixers) and moved by hand. To the right are the cooling tables, which can be hooked up to hot or cold water sources for a specific temperature. They do almost everything by hand, with a little help from an enrober. Any I Love Lucy fans? Remember the episode where she and Ethel had jobs at a candy factory? 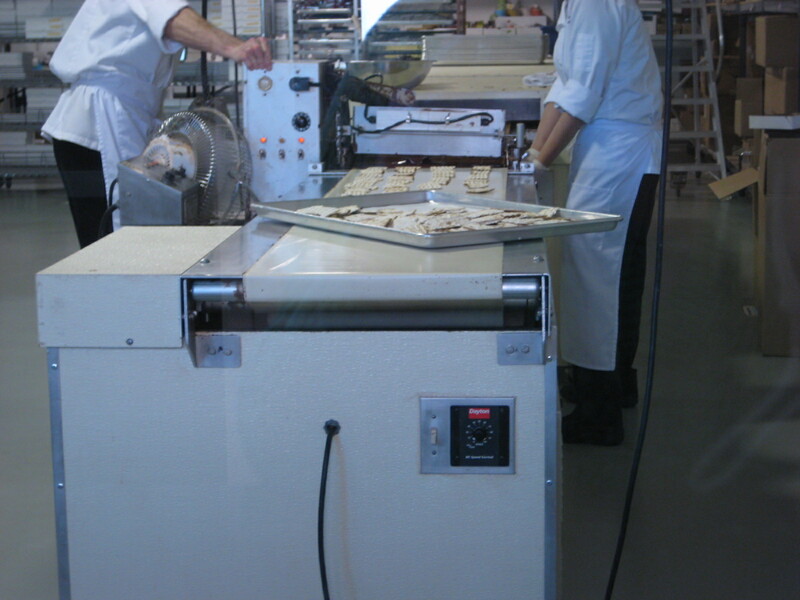 Apparently, that episode was filmed at the See's Candy factory in L.A. This one doesn't go quite as fast. After the tour, we had a tasting. Yum. We started with the passionfruit ganache in a bittersweet chocolate shell. It was very good and the passionfruit was a subtle sweetening of the ganache. I don't prefer fruited chocolate largely because there's so much fruit flavor that it's an assault on the tastebuds. I believe the chocolate should always be dominant and it works here. We started with fruit and went on to fruited marzipan. It happens that Chuck dislikes European-style marzipan, which is something like 60% sugar and 40% almonds. Too sweet. So, he reversed it, making almonds the dominant component. I can't say I disagree. I liked the nutty and sweet mixture infused with Meyer lemon. I love, love, love Meyer lemon and even liked it with chocolate. Their fleur de sel caramels are one of the best-sellers. They make their caramel very dark and slightly burnt. 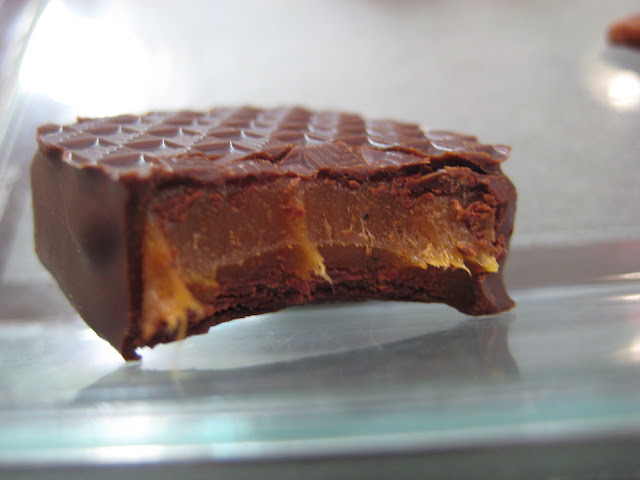 The salt takes the edge off of the caramel and mitigates the acridity of the burnt flavor. Also, salt brings out sweet on the tongue by essentially fooling the tastebuds, leading to a powerful, but not overwhelming, burst of dark and rich sweetness. 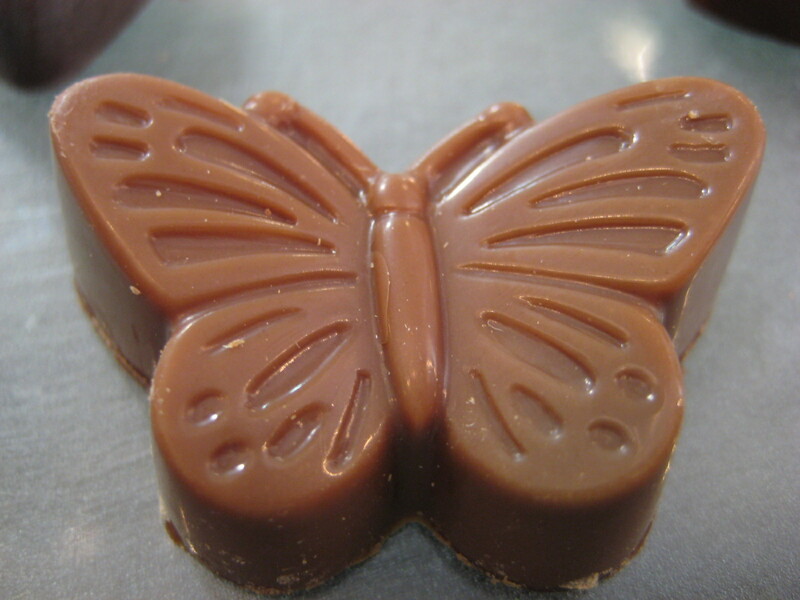 The chocolate peanut butterfly was exceptional. It is a peanut praline, cooked dark and ground finely, mixed with more chocolate to create a strongly nutty and slightly crumbly mixture. As with the fleur de sel, a careful understanding of how salty and sweet work together bring out the best out of the nuts and sugar. 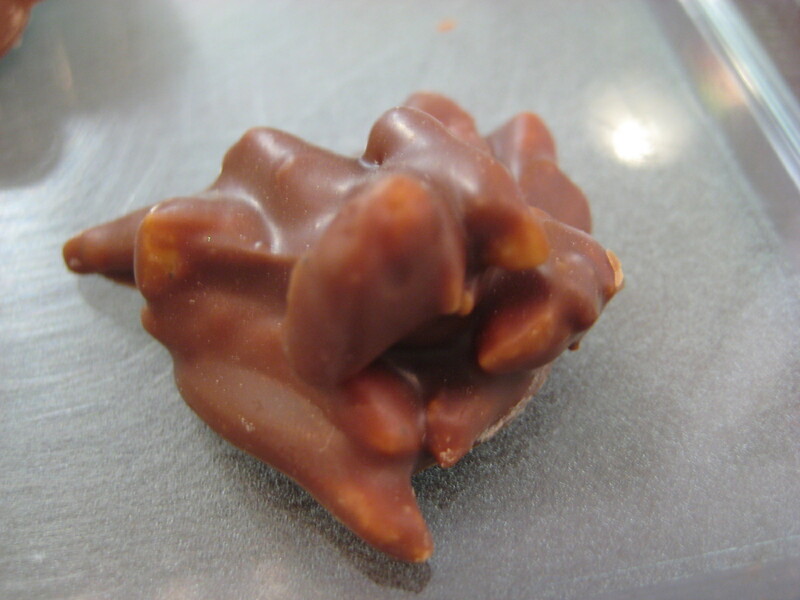 Last, but not least, was the caramelized almond cluster. Everyone and their mother makes this chocolate and I normally despise it. Why? It's a cluster of nuts dipped in chocolate. If the nuts are of a poor quality, then they're hard and/or flavorless. Otherwise, the balance is completely off, with the chocolate being a background player or the nuts being over-salted. This particular nut cluster brought me back into the fold. They roast organic almond slivers, then coat them in a sugar syrup to give them a sweet crunch. 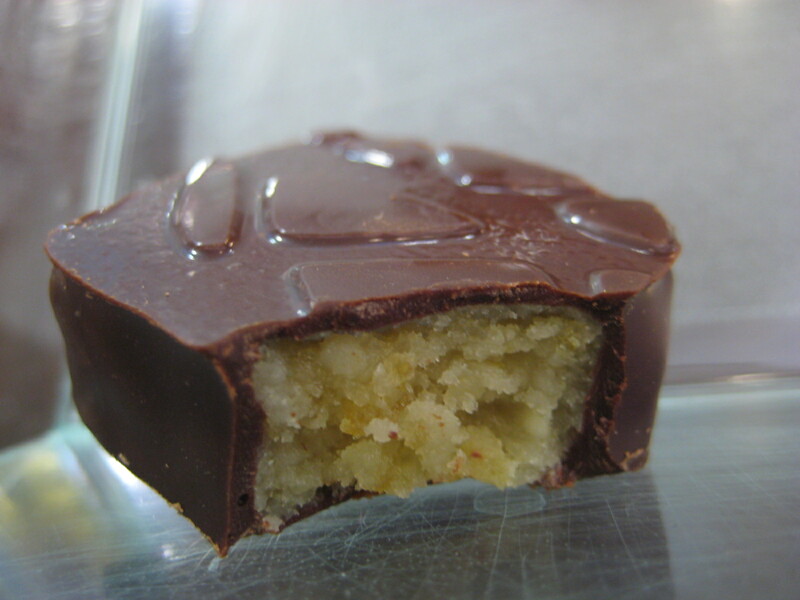 Afterwards, the almonds are coated in chocolate. This results in a crunchy, not hard, cluster that's nicely balanced. 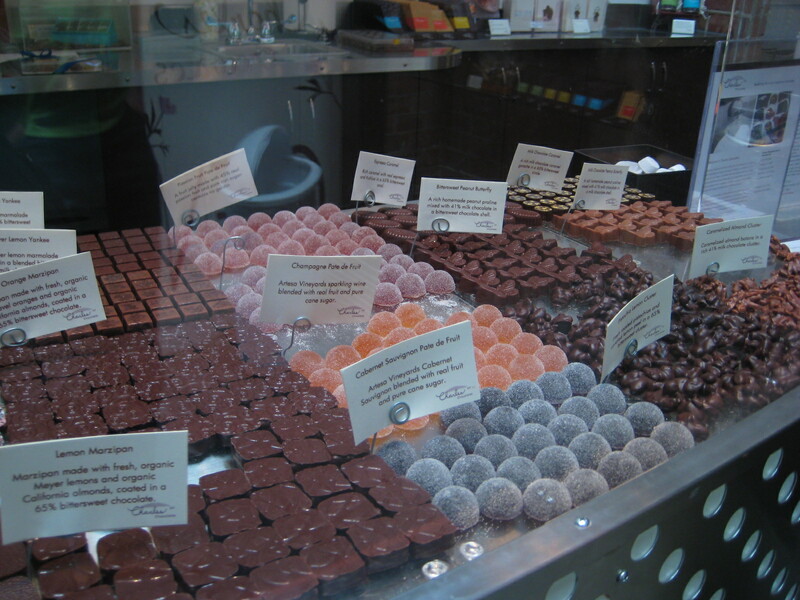 It's definitely worth a visit and the chocolates are to-die-for. 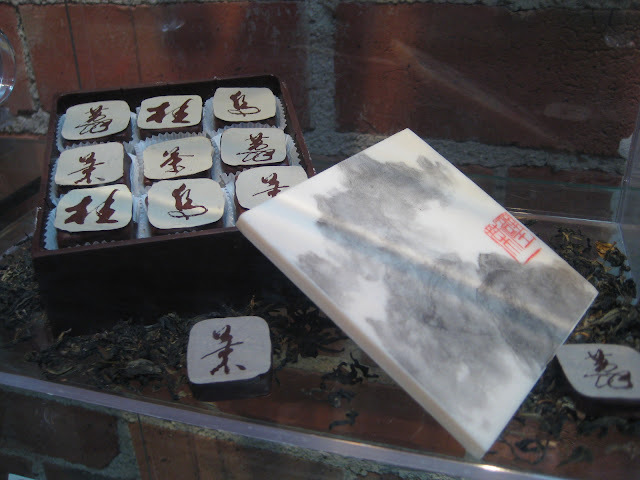 We purchased a few of their chocolates, including two of the tea infused chocolates (jasmine and charcoal-roasted oolong... my favorite teas). From the bar, they retail for $54/lb. and for our order, it came out to roughly $1/piece. 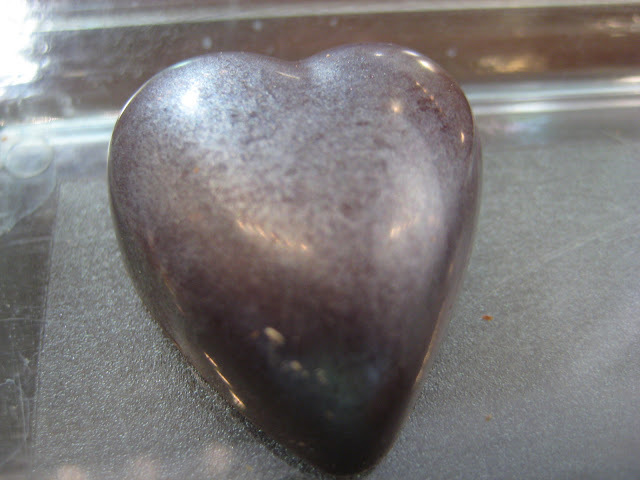 It's pricey for a 1 inch x 1 inch piece of chocolate, but the quality can't easily be topped. I could give up chocolate but I'm not a quitter.Put the chocolate in the bag and nobody gets hurt.A day without chocolate is a day without sunshine. I think I prefer Recchiuti's chocolates overall, but this looks interesting, might have to check it out on the next trip up there!